Twenty years ago, I stood on the dangerous and decrepit former incarnation of the Hungerford pedestrian bridge that connects the north and south banks of the River Thames. The old bridge was afflicted with crime and it wasn’t a place to linger. But that night, I looked out over the city skyline and asked – as though London were a wise mentor capable of answering back – whether life got any easier. 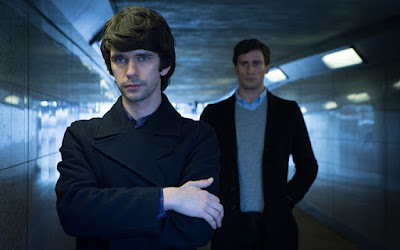 Herein lies the premise for my first television drama series London Spy, a thriller which opens with my character, Danny (played by the Bafta-winning actor Ben Whishaw) standing on Lambeth Bridge, feeling low and asking the London skyline whether life gets any easier. London answers him with a chance encounter, an early morning runner who stops to ask if he’s OK. Introducing himself as Alex, an unusual connection forms between these men who are opposites in many ways. It’s unusual in the sense that it’s special to both parties, but it’s also unusual for mainstream drama on the BBC, which rarely places gay relationships at the heart of stories. Tim Rob Smith, the writer of London Spy, which starts on BBC2 this evening, writing for the Telegraph. Jim Broadbent, quoted in The Guardian. Note Broadbent appears to be talking about the relationship between his character and Whishaw's - not our two star-crossed young gay lovers, as The Guardian headline implies. Whatever, 'happens to be gay', is such a braindead and banal cliche - and the three main characters sexuality hardly seems incidental to this story - so can we just not? "Whatever, 'happens to be gay', is such a braindead and banal cliche, can we just not?" Sometimes cliches, even banal ones, do a decent job, as here.